Here, Kevin condensed much of the conversation that's been occurring across multiple posts. Sometime in 1911, A. J. Churchill purchased a large tract of land on the west bank of Jefferson Parish and named part of it Churchill Farms. Through a company known as Eddick Reclamation Company, Inc., Churchill began “reclaiming” marsh land located on pieces/parts of a 3,000+/- acre tract of land. During the 1920s and 1930s, Churchill Farms was marketed as “Desirable Farm Lands Ready for Planting” and “across the Mississippi River from the finest residential section of New Orleans,……, and they are situated at the western approach to the projected Public Highway and railroad bridge already in the course of construction.” The Huey P. Long Bridge was completed in 1935. Back in 1927, there was also a planned residential development called Richland Park being promoted by the owners and operators of Churchill Farms. A limited number of parcels of land were sold. In 1938 or 1939, the name of Eddick Reclamation was changed to Churchill Farms, Inc. Eventually, the USACE would find the reclamation project a failure. In the early 1960s, Churchill Farms and Churchill Farms, Inc. came under the scrutiny of the FBI because an individual named Carlos Marcello was an owner/shareholder in both. 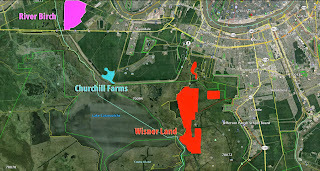 According to 1960s FBI records, Churchill Farms has being marketed, politicked and touted as: the site for the new Saints “domed stadium;” the route for a new highway; residential developments; and, an industrial development with the land to be sold for $18 million. There are numerous fascinating FBI records that have been made public through the Mary Ferrell Foundation at www.maryferrell.org. A couple of the more interesting and relevant to this AZ comment bump discuss then-councilman Eddie Sapir present with Joseph “Little Joe” Marcello (current owner of Churchill Farms) and others at the Backstage 500 Club, and later at the Ivanhoe Club. Can somebody tell me if Michael Sherman’s former law partner, Eddie Sapir, was a councilman in 1968? July 14, 2004, by Jefferson Parish Council Resolution No. 101511, JP authorized the JEDCO to enter into Cooperative Endeavor Agreement with Churchill Farms regarding the development of a 500-acre technology and business park at Churchill Farms. July 19, 2005, per the CEA, 40 acres of land were donated by Churchill to JEDCO for Churchill Technology Park and headquarters. Also on this date, by resolutions, Churchill and JEDCO entered into an Amended and Restated Cooperative Endeavor Agreement to expedite the development of the 500acres. According to Tulane, Michael G. Sherman came “back” to New Orleans right after Hurricane Katrina to help rebuild the City through his work with a big DC law firm. Sometime later in 2005, Michael Sherman left the employ of the big DC firm and becomes a vice president of The Coastal Companies, and with Churchill Farms, tries to set up a residential community of some kind on a large portion of Churchill Farms’ land. Eventually, this project fails. May and June 2007, Michael Sherman acted as Joseph Marcello's representative and attorney during the USACE inspection of a piece of Churchill Farms property to be used as a dirt pit. Michael Sherman gave "The Coastal Companies" as his business name. November 15, 2007, Joseph Marcello, citing big, new developments on the horizon for Churchill Farms, and holding the Amended and Restated Cooperative Endeavor Agreement, gets the JEDCO to purchase an additional 50 acres for $1 million cash, with no guarantee of title. Acting as a witness to the cash sale was local commercial realtor Don Randon. Don Randon would later tell the JEDCO that Michael Sherman is one of his important Churchill team members. Now, 78 years after the Huey P. Long Bridge was completed, Churchill Farms, Don Randon, Michael Sherman and others are using the expansion of the Huey P. Long as the new reason to buy and develop the Churchill Farms land that hasn’t seemed to catch anybody’s fancy in over 100 years. This time it’s “Fairfield.” According to public records, Michael Sherman and his “Sherman Strategies, LLC” are involved with the West Bank Strategic Plan along with Marrerro Land, Churchill Farms, Don Randon, Joseph Marcello, Marsh Investment, etc. Don’t be surprised by the fact that the Wisner Donation owns land not far from this Fairfield community. 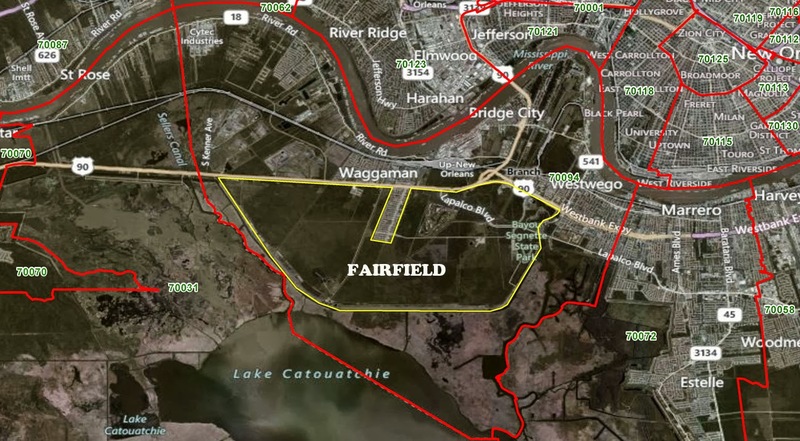 In a 6/9/13 NOLA news article discussing the new “Fairfield” community and growth on the west bank, the JEDCO claimed it saved $1 million in costs by using material excavated from several Southeast Louisiana Urban Flood Control (SELA) projects to fill in low-lying spots in the area of the Churchill Technology & Business Park (CTBP). In 2012, during a SELA canal widening project along the Oil Company Canal and Justice Canal, extensive asbestos contamination was discovered in the soils and sediments being excavated. Here’s the kicker though: the asbestos contamination was not discovered by the USACE contractors at the location where the excavation was taking place – it was discovered by a JEDCO employee after hundreds of dump trucks carrying more than 6,000 cubic yards of excavated and contaminated soil had traveled the local streets and roads out to the CTBP where the tainted soil was dumped to fill in a low-lying spot at the front of the property. As of February 2013, JP had excavated and hauled away over 6,000 cubic yards of asbestos contaminated fill material from CTBP, while still more asbestos contaminated soil had been pushed into a large pile at the CTPB site. A side note. While the JEDCO “saved” $1 million by using fill material from the SELA projects, it has cost the JP taxpayers over $1.3 million to go back and excavate most, not all, of the asbestos-contaminated fill soil at JEDCO and dispose of it properly. This was accomplished by using an asbestos abatement contractor who had an existing contract with a $30k balance left on it. The maximum limit of the contract (originally $200k) was increased twice by resolution of the council – first to $500k; then to $1.3 million. And, it’s still not completed. On 8/28/2013, the JP Council passed a resolution to accept sealed bids for the removal and disposal of the asbestos soil still remaining at the CTBP property. According to the Minutes of the 8/28/2013 council meeting (Item #10), the resolution was adopted and passed. That’s all I can share for now. 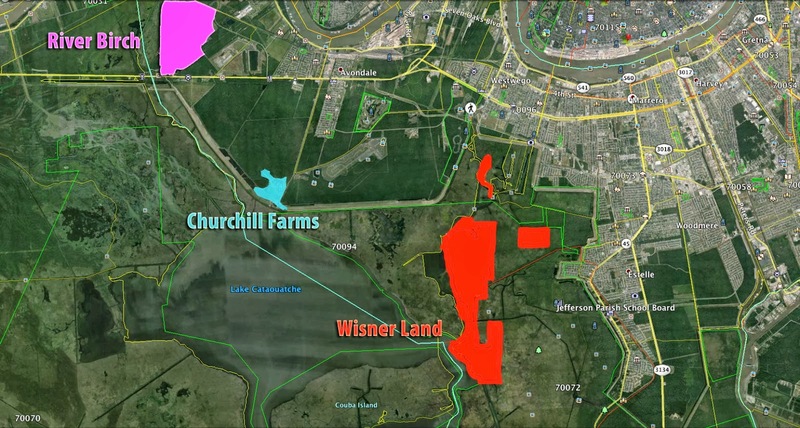 I made a map of the Churchill Farms property in relation to Wisner property. 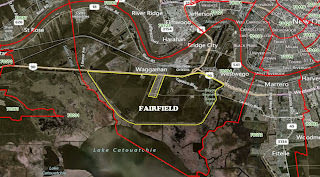 It doesn't show the entire Fairfield development area, I am still not clear on that. I will update the map when I find out but basically anything inside the levee in that area is slated for development in some capacity. This map is from a JEDCO media packet which outlines the Fairfield footprint. Also I'm being told the Churchill Farms footprint is much larger than what I have on the map above but the Wisner footprint is correct. I'll try to update that soon. In 1968 Eddie Sapir was a New Orleans City Council member for District B who coincidentally also co-authored the legislation to build the Superdome. He served on the Council from 1967 to 1974. Then was a municipal court judge in Orleans Parish until he was forced to resign due to his concealed ownership interest in the proposed Chalmette Casino. However, Sapir's biggest challenge reportedly came from the Fairgrounds/Churchill in the 2000's when he tried to extort the Fairgrounds/Churchill by purposefully withholding their casino permits unless they assigned him the janitorial contracts. This battled purportedly took place over several years and the Fairgrounds/Churchill won out when Sapir was term-limited from the City Council. It was rumored that executives from the Fairgrounds/Churchill repeatedly pressed the US Attorneys office to intervene but they refused for unknown reasons. The drawing of Churchill/Fairfield isn't accurate. What you have highlighted is probably 5 to 10% of the total property. It actually connects from River Birch to Wisner. I knew this rang some sort of bell. Here's the NOLA.com story.